This week I had a wonderful opportunity to be enthralled by young singing stars at the i-Genius grand finale sponsored by Max Life Insurance. Organised on a humongous scale the talent hunt for India’s best singing stars between the age group of 8 to 15 years saw more than 1.26 lakh entries. After three rigorous phases, the selection panel of Bollywood music director Salim Merchant, youtube find Shraddha Sharma and Devraj Sanyal of Universal Music shortlisted 10 performers who would have the final shot at the title. Max Life Insurance and Universal Music came together on the night of December 17th to show the world, the kind of talent that rests within each and every corner of this country. The evening saw wonderful performances by Mansi Scott, Shraddha Sharma and Salim Merchant who then opened the stage for the competition. As each of the children sung their hearts out, I just sat back to enjoy the varied renditions instead of judging the song or performance. Just as we thought that the competition was heating up, out came the band Raaga Trippin’ to perform a series of amazing Acappella tracks. So mesmerized I was with their sheer talent and coordination that I forgot to click any pictures or send out any tweets. But you must check them out, they are spectacular. Each child who performed deserved to take home the trophy and the contract with Universal Music, because each of them was a true i-genius Young Singing Star. The outstanding performances of each of the 10 finalists whilst the two rounds were mesmerising and soulful. Each child has their own sense of music and their own way of singing the chosen song. However there can really be only one winner and so after a tough task, the jury came back with the verdict. 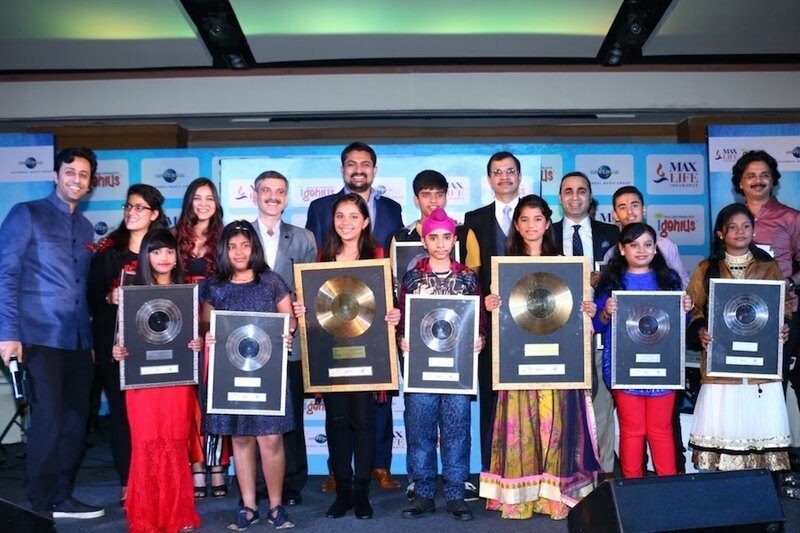 Shradha Shreya and Shivam Ahuja won the grand finale of the Max Life Insurance ‘i-genius Young Singing Stars’ in the senior and junior category respectively. They not only took home the trophy but also promising careers that jump start with an album contract with Universal Music Group. Even the other contestants were not going home without anything; all have a single song contract with Universal Music Group. Isn’t that simply amazing? I cannot wait to get my hands on the album when it’s out. And you? Max Life Insurance is one of the leading life insurers in India, a joint venture between Max India Ltd. and Mitsui Sumitomo Insurance Co. Ltd. It offers comprehensive life insurance and retirement solutions for long-term savings and protection, focusing on quality of advice, sound investment expertise and service excellence. Universal Music India Pvt. Ltd. is home to multiple record labels that cater to the extremely rich Indian catalogue comprising songs from classic Hindi and Regional Films, IndiPop, Bhangra, Ghazals and Devotional. It’s enviable catalogue includes artists such as Asha Bhosle, Anup Jalota, Bombay Vikings, Jagjit Singh, JoSh, Malkit Singh, Pankaj Udhas, Panjabi MC, Raghav, Mohit Chouhan, Euphoria, Adnan Sami, Rabbi Shergill, Rahat Fateh Ali Khan to name a few. week I had a wonderful opportunity to be enthralled by young singing stars at the i-Genius grand finale sponsored by Max Life Insurance.